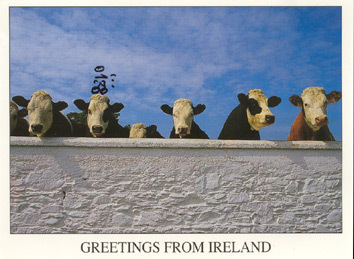 Something on this card might lead you to believe I’m in Ireland with a herd of my mothers. Well I was in Ireland but I’m not any more as I’m in England having recently come hither from Scotland (via Wales) where I was called upon to gush forth upon the joys of cycling at the Edinburgh Book Festival. Yes, my new book Slow Coast Home, a mighty fat tome ? far too impractically heavy to cart about in a pannier but a most effective door-stop none-the-less ? has hit the shops and could well be lying in wait behind a door to trip you up as I write. My plan after Edinburgh was to head back to Denmark to have another attempt at reaching Estonia, Latvia, Lithuania and multiple points East. But while I was here in these fine September sun-dazzled isles, my publishers sent me packing on a 3 week book-flogging tour. As the Baltic States will be plunging into a shivering Siberian wind-blasted winter by the time I reach them, I’ve got a new plan of action: cycle to Estonia via New Zealand. That way I might just keep up with the sun.